No welding needed…big bolts are strong! All of this is less than $100. There are a lot better things in your home brewery to spend the extra $400+ on (think 90 inch, 3 compartment, stainless steel sink). Face it, a brewery stand is going to go to crap real fast. You WILL have boilovers no matter how careful you are as a seasoned home brewer. Once that stuff drips and burns you are not cleaning it easily. Let the stand be black painted steel, let the stand take the abuse of burning wort. Let your stand wear your spills like a badge of honor. Planning your stand is the most important aspect of your home brewery for down-the-road flexibility. Many stands are 3 tier to take advantage of gravity draining. Others stands are fully flat with all the kegs in a row relying on a pump for every step. Some are a two-tier system. 1, 2 or 3 Tier? How about a ‘compact’ 3 tier? After much reflection, drinking and more reflection. I chose and designed the never-seen-before ‘compact’ 3-tiered system. Most 3 tiers (think brew tree and others) have the kegs fully separated. This makes you need a sizeable step stool. Ridiculous design. Just knowing the volumes of water and wort you will have in the pots for gravity draining and sparging, you CAN overlap the kegs saving you nearly a foot or two of space. Drain and sparge hoses can be drilled right below the curve of the keg…or they can just go through the handles…your max liquid line in the mashtun is about 4 inches below the very top handles of the keg. Sure, if you use actual kettles instead of kegs, you gain that 4 inches…but chances are you won’t have them filled-to-the-brim. You know that is asking for trouble. 1 tier systems, in my opinion, are a waste of space. They require 2 pumps. The first pump to sparge, the second pump to pump the wort to the boil kettle during sparging. They are sprawled out horizontally. Waste of space. I have always been a proponent of ‘build up and not out’. Not going 1 tier saves you $150 in pump costs and any associated plumbing. 2 tier was a consideration, but still unnecessary as it is essentially still stretched out like a 1 tier. You do only need one pump as half of the process can be gravity drained. Here is a conventional 3-Tier. They start at $500. Conventional 3-tier ‘brew trees’ are even worse than a 2 tier system due to their height. Conventional 3 tiers do not overlap kettles. The top of your topmost kettle can get to 7′-9′. That is insane. Plus a lot of 3 tier stands market the fact that “you don’t need a pump.” Face it. If you are going to spend over $500 on a beer stand, WHY would you not get a $150 pump and WHY would you want your top kettle sitting around 8’+ ? The mash-tun is even still high if placed in the middle requiring a stand. Some designs have the mash-tun at the very top. Baaaaadddd idea. I don’t want to be fool’in with grain 8-9′ up. You also have to leave about 2′-3′ from the bottom of the bottom-most kettle to the floor so that you can gravity drain the BK into your fermentor. That is a lot of wasted space. Money on a pump is money well spent to rid yourself of the terrible inefficiencies of a traditional 3 tier. And lets face it, a $150 pump will be the least of your expenses if you buy these stands along with kettles and burners. It’s only about 5′ 4″ to the top of the boil kettle. After brewing several batches, knowing flame and burner heights, knowing liquid heights in all the pots, I bet the height from floor to top of the boil kettle can be gotten down to 4′ 10′ tall. Really. Now THAT is COMPACT! The top kettle is the boil kettle and the sparge kettle. The middle kettle is the mash/lauter tun. It’s belly-height with easy access to the grains for stirring. You can easily slide the keg off the stand to empty the spent grains. (difficult if it was on top). The bottom kettle is the combined hot liquor tank and grant. This was a careful design element -the placement – as it allows one to brew back-to-back batches. As your first batch is done sparging and pumped to the boil kettle, you fill the bottom HLT with 2nd batch mash-in water and fire-it-up to temp. Then you can empty and clean your mash-tun while your water heats. 90 minutes later your first batch will be pumped out of the top kettle. Your sparge water will be at temperature for your second batch in the HLT. After first batch pump out you pump your sparge water (at temp) to the empty boil kettle at the top and start sparrging. The only limit to your system is how fast you can cool your wort at pumpout when brewing back-to-back batches. The compact 3 tier is the only way to go. * See the red ‘liquid lines’? These represent the ‘top’ of the keg before the curvature happens. Note that after many brews, my liquid is always lower than what’s pictured, ensuring that a siphon between the mash-tun and the grant is always maintained as there will be a height difference between the bottom of the upper draining kettle and the liquid line of the lower receiving kettle. DURING RECIRCULATION (MASHOUT), YOU CAN DO THIS WITH A PUMP, YOU DON’T NEED TO GRAVITY DRAIN INTO THE GRANT ONLY TO PUMP BACK TO THE MASHTUN (MY OLD DESIGN). WE DIDN’T ENCOUNTER STUCK GRAIN BEDS WITH NON-ADJUNCT BREWS SO WE ENDED UP ELIMINATING THE GRANT FOR RIMS AND RECIRCULATED DIRECTLY FROM MASHTUN BACK TO THE TOP OF IT VIA THE PUMP ONLY FOR MASHOUT – THE PUMP IS THROTTLED OF COURSE. “I am trying to decide if I could lower the mash tun and kettle, and remove the burner from under the grant to make this even shorter. If I intend to recirc while mashing, I don’t see why I couldn’t just pump directly to the grant. NOTE, DURING SPARGING, YOU DO WANT TO GRAVITY DRAIN…SLOWLY…AT LEAST OVER 30 MINUTES IMHO. SO YOU DO NEED THE GRANT. TO SAVE TIME YOU DO NEED TO HEAT THE GRANT AS IT SPARGES SO THE SPARGED WART CAN GET TO NEAR BOILING BY THE TIME YOU ARE DONE SPARGING. SO YOU DO NEED ROOM FOR THE BURNER. IF TIME ISN’T A PROBLEM, THEN YES, YOU CAN FORGO THE BURNER ON THE GRANT AND LOWER THE SYSTEM SEVERAL INCHES MORE. I am brewing all grain 5 gallon batches, I love the idea of your compact system. Would this work with a cooler mash tun setup? I don’t see why not – it may even be more compact. Just so you appropriately adjust the dimensions. You may even be able to have the whole system be adjustable by drilling additional holes at different levels so you can change it as your brew system changes, maybe from cooler to kettle, or 5 to 10 to bigger gallon batches.. I really like the design of this system. 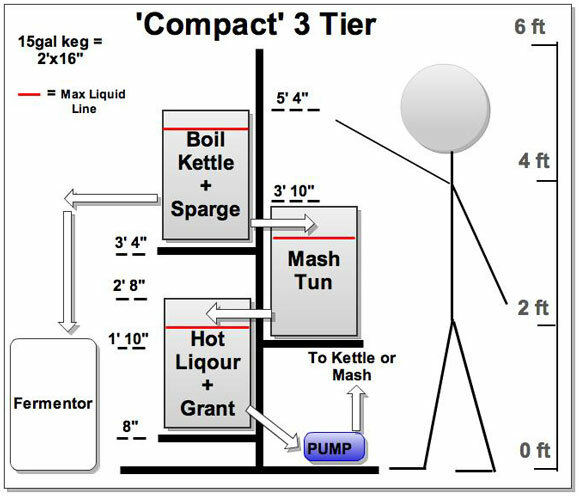 I have been looking for a compact system for a while and have thought about RIMS & Herms, but this system may work for me, but I am not sure I understand how you are recirculating Are you going through your HLT to the pump then back to MT? Or do you have another hose to your pump and back to MT? For RIMS on mashout to 170, my old design had the MT gravity drain to the HLT which had the flame, then pumped back to the MT. This required attention as you were constantly adjusting the valving to maintain about 2-4 inches in the HLT where you were heating the wort. BUT the current design I just gently heat the MT directly for mashout and recirculate via this picture: https://halfbarrelbrewer.com/recirculating-infusion-mash-system/ – this method doesn’t compact the grain bed. I hope this helps. Followup with anymore questions. I like your compact design. Am looking to build something to serve as a pilot system for my brewery. Have to ask though – did you consider using the top tier as your HLT, your middle tier as your BK, and your bottom tier as your MLT? In such a configuration, you could gravity strike and sparge from your high HLT into your low MLT, then pump from the MLT up to a HERMS coil in the HLT to step mash or mash out, and when mash out complete, you redirect the pumped wort from the MLT into the BK on the middle tier. Your middle tier appears to be high enough to allow filling of fermentors via gravity, or you could pump through a counterflow/plate chiller into a fermentor as well. This arrangement would also allow you to easily empty a low MLT and get reconfigured to start your second batch, and it would also eliminate the need to pump your wort from one kettle up to the BK just to get your boil started. Just wondering if you considered that arrangement, and if so, why you ultimately chose to go with your current setup. I’ve used a MLT on my lowest level for years and have been very pleased and think I could use this type of frame design to keep things tidy in the brewhouse. Thanks for posting your info! All you say is true. It can be totally workable with success. For me, I used the high BK as my sparge water source and collected the wort in the bottom-most kettle, a grant (wort collection)- which by the time the topmost BK was empty of sparge water, I was able to fill the BK with wort.